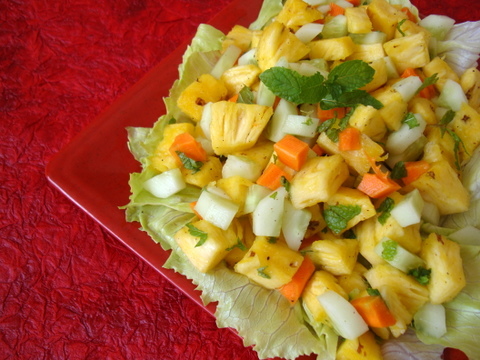 Prepared a Thai inspired salad using pineapple and cucumber, a refreshing medley along with a touch of fresh mint. I omitted roasted peanuts which are an integral part of most Thai salads. You can also add some grated fresh coconut and summer fruit, mango or papaya. In a bowl, whisk 1 tsp of lemon juice, 1/4 tbsp of olive oil, 1 tbsp of honey, few chopped fresh pudina leaves, salt and crushed pepper to taste. Add 2 cups of pineapple pieces, 1 peeled and chopped carrot and 1 peeled and chopped cucumber. Toss well till combined with dressing. Serve chilled. Awesome. Love the Pineapple Salad. Looks gorgeous….thanks for this beautiful recipe !!!!!! Love the picture, it is tempting and I am imaging all those wonderful tastes in my mouth. Beautiful. awesome salad sailu… looks soo tempting!!! I love pineapples… great stuff! also made veg stuffed omlette…was very yummy.. I don’t like to eat salad but this pineapple salad looks very tasty.